Life Is Beautiful >> 2014 just got a lot more beautiful with the additions to an already stacked festival lineup in fabulous downtown Las Vegas. The extra boost comes in the form of electro-pop group Little Dragon, mega-DJ Baauer, songstress Kimbra, Nahko and Medicine for the People, breakout band Echosmith and experimental indie rock group Bear Hands. In its second year, LIB has already morphed into a 3-day festival to rival fellow multi-genre massives like Coachella and Lollapalooza. Thus, lucky festival goers will get another full day to enjoy magnificent art in many forms, delectable to the max cuisine and of course, a mondo killer bill that includes The Foo Fighters, Outkast, Lionel Richie and Yeezus himself, Kanye West. 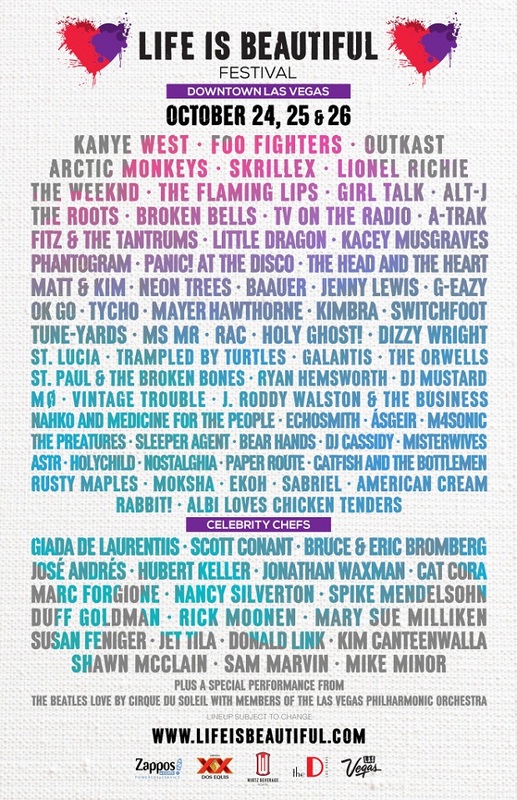 Some other artists to get excited about aside from the aforementioned: Girl Talk, Panic! At The Disco, Matt & Kim, Phantogram, Fitz & The Tantrums, Broken Bells and Holy Ghost! Stay tuned over the next few months as the zB crew and I break down the lineup by day, provide sound advice to navigate the grounds and optimize your festival experience! This entry was posted in festival, music, new music, party, rando, shows and tagged baauer, bear hands, echosmith, fitz & the tantrums, foo fighters, girl talk, holy ghost, kanye west, kimbra, las vegas, life is beautiful, lionel richie, little dragon, matt and kim, nahko and medicine for the people, outkast, panic at the disco, phantogram, yeezus. Bookmark the permalink.